A lovely print, it was easy to hang and looks great! The colors are just as pictured and are beautiful shades of green. A good value for the money. 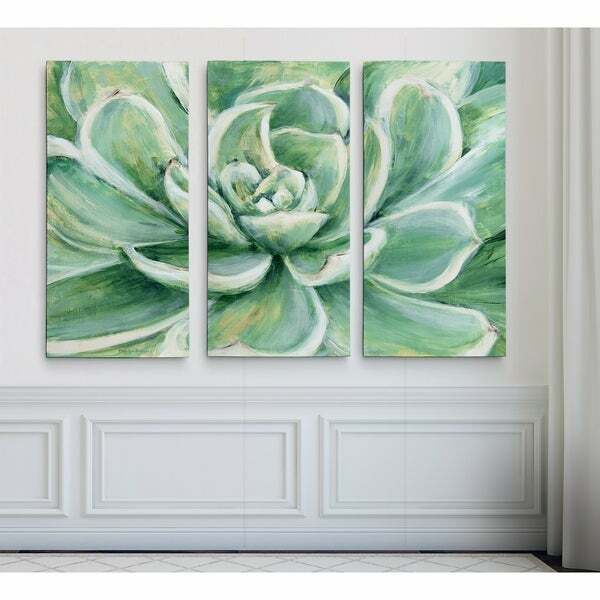 Succulent -Gallery Wrapped Multi Piece Canvas A premium hand wrapped Giclee canvas. 100-percent Created to last. Individually hand wrapped to very high standards. Printed and inspected one at a time utilizing the latest archival UltraChrome Giclee inks Available in 3 sizes for you to choose from 24"X36" TOTAL SIZE - Consisting of 3 Total Panels Each measuring 12"x24" x1.5" deep 32"X48" TOTAL SIZE - Consisting of 3 Total Panels Each measuring 16"x32" x1.5" deep 40"X60" TOTAL SIZE - Consisting of 3 Total Panels Each measuring 20"x40" x1.5" deep Each piece includes hanging accessories and is ready to hang. You need only to apply an anchor to the wall of your choice. The colors in the 24x36 set are deep and vibrant on a sturdy canvas, and there's a subtle three-dimensional quality to the print when you stand back and look at it from a distance. The three panels are "ready to hang", but I found that I needed to move the hanger on one of the panels quite a bit to make that panel hang level with the other two -- so not quite 5 stars. This three piece print looks exactly as it does in the pictures online. The colors are really lovely. The fact that it is not textured, which I usually prefer, does not take away from how pretty it really is. I have a room with two story ceilings, so I needed something big to put on my wall. I ordered the largest size they offer and I love how it looks. Was pleasantly surprised of how striking this piece is. It is a large piece that can stand alone. The colors are varying shades of green. I love this piece and would order again if the need arises. Purchased this picture for over our master bed. It makes the room appear larger. The color is very pretty and the quality of the picture is excellent. I normally like pictures with a frame but this type wouldn't look good with a frame. Love it. Love it! Fit perfectly on the wall above my king sized bed. I love this piece. It looks great in the office centered over the desk. A soft statement piece. 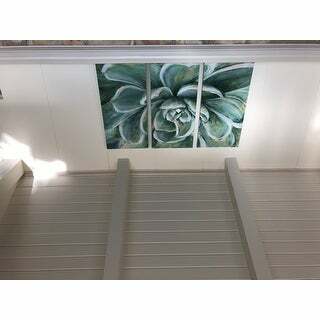 Light and easy to hang. I just love the dimensions, I got so many compliments about it, it really make my room look gorgeous, I am so glad I decided to get it, I going to get one for my sister later. This is the color scheme I’m looking for but I’d prefer it to be in a frame so it would give it that little extra pop. It’s really hard finding something I like in this color. If you like your art on canvas then you’ll like this. Perfect compliment to my living room. Beautiful! The colors are just like the web picture!! 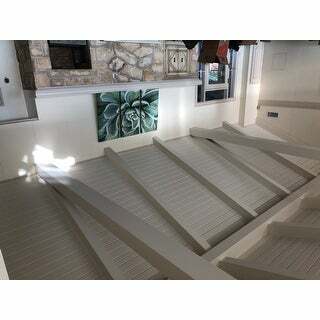 "Can you describe the colors used, specifically if it's white or ivory. Thanks"
It is cheerful and organic looking.